We have a series of Dart Articles that we've added over time. 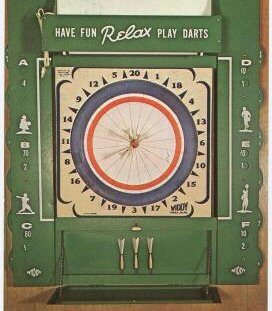 You'll find games similar to American darts, and dart throwing advice. We also have a section on Vintage Darts with pictures of darts and boards from days long gone by. Any of the group or split dart games can also be shot with teams, instead of individual players. Some games lend themselves to team play over individual play because there are two parts to each shooting round. In these games, one player will shoot the first part, and his actions will affect how the second player's darts are scored. Cork Before the Inning is type of team dart game. Besides the cork, several innings are called (usually three or four). They can be any innings, so one particular version of this game might be . . .
Cork Before the Inning, 13 - 20 - 10. In this game, one player throws three darts at the cork. The second player on the team then throws three darts at the 13. Both teams will do this, and then the first shooting round comes to a close. If the cork shooter hits one cork, each of the points the 13 shooter hits will count as their normal value. If the cork shooter hits two corks, the point values are doubled. If he hits three corks, the calues are tripled. Should he fail to hit a cork, the 13 shooter does not get the chance to shoot. 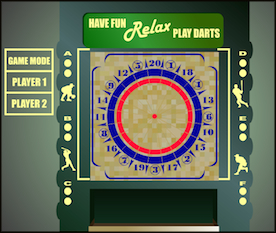 This idea of one shooter aiming at one smaller section of the board, and the second shooter shooting the inning works well with another popular team dart game, Trip 13. It is played the same as Cork Before the Inning, except the first shooter aims at the triple section of the thirteenth inning. When playing less exotic games (say, One to Five - Group Darts), it's not unusual for minimum scoring requirements to be used in team dart games. They can be placed on each man in the game, or on the team as a whole. An example would be "Team Seven or Better to Count". In this case, the team's combined score for the inning would need to be at least seven points, or they would get credit for no points scored. Another example might be "Five a Man to Count". In this case, any player hitting five or better would get credit for their score. Any man hitting less than five would recieve no credit for their points.